There are different types of mooring lines doing different jobs for tying to different parts of the boat. 1. Bow Lines - stop the boat moving in and out towards the dock. 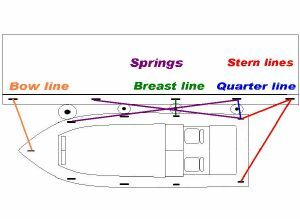 The Bow lines ( tied from the front or bows of the boat) should be about 1.5 - 2 times the length of the boat, LOA (length over all). These should be attached to cleats at the front the boat. You should have one on each side of the bows so as to be prepared for tying up on either side so 2 Bow lines would be needed. 2. Springs - mooring lines which are used to stop the boat moving backwards and forwards. One Spring is tied to a cleat at the back (stern) of the boat then tied to the quay near the front (bows) of the boat. The other is tied to a cleat at the front of the boat then tied to the quay near the back of the boat. The length of springs should be about 1.75 times the length of the boat. 2 Springs would be needed. 3. Breast rope - can be used to tie up on the dock, or if rafting-up (mooring alongside another boat on a dock) to the other boat. The Breat rope is tied from the bows of the boat straight across to the pontoon . The Breast rope should be about .75 of the length of the boat. 4. 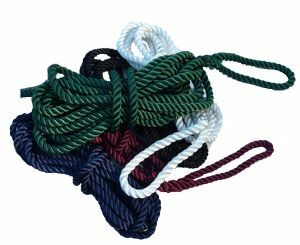 Quarter rope - can be used to tie up on the dock, or if rafting-up (mooring alongside another boat on a dock) to the other boat. The Quarter rope is tied from the stern of the boat straight across to the pontoon. The Quarter rope should be about .75 of the length of the boat. 1 Quarter rope is needed. 5. Stern lines stop the boat moving in and out towards the dock. These Stern lines ( tied from the back or stern of the boat) should be about 1.5 - 2 times the length of the boat, LOA (length over all). Theses should be attached to cleats at the back of the boat. You should have one on each side of the stern so as to be prepared for tying up on either side so 2 Stern lines would be needed. It would be sensible to have an eye splice on one end of your mooring lines so they are easy to attach to the boat. The other end can have a backsplice to keep it tidy or can simply be taped and melted. The eye splice is 10" long. This is only a guide. Longer lines may be needed if the moorings are tidal and choppy. Shorter lines may be needed for non-tidal rivers and canals, though even on non-tidal rivers you may find that you need a good length of line particularly if going through deep locks.